CLIFTONVILLE’S new manager Paddy McLaughlin is relishing his debut in the Solitude hot-seat on Saturday as the Reds play host to Newry City (3pm kick-off). Former Institute boss McLaughlin was unveiled as successor to Barry Gray on Monday afternoon, having fought off stiff competition from Kenny Shiels and Warren Feeney. The 39-year old is looking forward to this week’s preparations ahead of the Newry clash and is determined to hit the ground running. “I’m really looking forward to it,” McLaughlin insists. “I’m looking forward to meeting the boys and getting the first training session done. It’s important for us to get up and running. Institute announced the departure of McLaughlin as-well-as assistant Brian Donaghy and goalkeeping coach Conleth McCrudden (both of whom will take up their respective positions) via Twitter and the former Stute and Coleraine defender admits it was hard to depart the club having represented it in three capacities over the years. “It was (hard) but it wasn’t a hard decision to make,” admits McLaughlin. “Because I’ve been at the club for so long as a player, a coach and a manager, it was always going to be tough to leave. “I was close to so many of the players and so many people at the club for so long, it was tough in that sense, but the opportunity to come to Cliftonville… anybody with any kind of ambition would jump at the chance like myself. McLaughlin has guided Stute to seventh place in the Premiership and his attacking football has won him plenty of plaudits this season. He hopes to implement a similar style at Solitude and get Cliftonville back to playing the football that they are famed for. 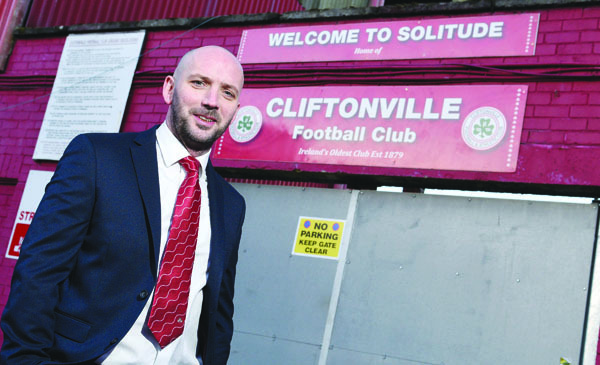 “We don’t want to make any empty promises we can’t fulfil, but we will try to get Cliftonville back to playing football that they are so famous for playing,” McLaughlin revealed. “A few years ago, they were winning leagues and winning cups. They were one of the top sides, not just on the pitch and results, but for performances. Although McLaughlin will not have the opportunity to add silverware this season, the new boss wants his side to push up the table and claim the elusive European spot via the play-offs. “Our target is to finish as high up the league as we can. We’re not here just to fulfil fixtures,” said McLaughlin. The Reds’ squad was boosted for the second-half of the season on deadline day last Thursday as Aaron Harkin made the switch from Institute ahead of his pre-contract arrival in the summer and Niall Grace joined on loan from Glenavon. “I know quite a few of them from watching during the season and analysing when we were playing Cliftonville ourselves,” acknowledged McLaughlin. “I know who they are and all about them. I know how lucky I am to be in charge of such a talented group and I’m looking forward to getting started.